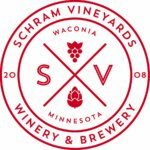 Minnesota’s First Winery & Brewery! Creating award-winning hand-crafted wines and distinctive brews all in a single location. The rustic chic tasting and tap room features a wine barrel room, outdoor pavilion, and patio all with lake and vineyard views. Products range from big reds and dry whites, to a line of sparkling wines. 4 flagship brews and a rotating selection of seasonals range from IPAs, Stouts, and Sours to unique barrel-aged brews. There’s a little something for everyone. Tastings, flights, by the glass, crowlers, and bottle sales available. Visit our tasting room year round, 6 days a week for a casual, inviting and educational experience.